As a sales person a good Sales Operations function can be your greatest asset, but only when you understand what they can do for you. If you think of Sales Ops as the CRM police or the process guard dogs, then this article will make their value to you clear. I had the help of Kelly Albada Jelgersma-Clarke of Unit 4 software in writing this blog. She has worked in Sales Operations very successfully for several years and she helped me to understand the vital role her team plays. Most companies with more than about 50 sales people will have a Sales Ops function. They vary a little from one organisation to another, some are called Sales Strategy and Ops, but they do roughly the same tasks. It’s worth remembering that this is a significant cost for any company so they really have to deliver a return on the investment for the organisation or they would not exist. Instead of thinking of Sales Ops as guard dogs, think of them as a combination of the best high school teacher you ever had and the man in the white coat who gives James Bond all the cool gadgets before he goes out on his mission. Let me explain. The role of Sales Ops is to deliver reliable revenue forecasts to the rest of the organisation. They use sales process, CRM software, pipeline management, deal management and sales enablement to help sales people achieve their targets. They make sales people perform better which in turn means that they earn their bonuses. You really want them on your side. A good sales process is vital to achieving targets. I have written a lot about the value of process in previous blogs so here's a brief summary – a good sales process is a vital toolkit to help you close the greatest number of deals and it will help you perform well consistently. The same applies to CRM. Of course sales people should spend most of their time selling not typing, but a well designed and managed software will deliver the maximum useful data for the minimum sales person time. It’s the job of Sales Ops to own the CRM and ensure it delivers value to Sales and other parts of the organisation. Remember that the CEO relies on this data to manage the organisation, so there is a strong link between Sales Ops and the C-suite. 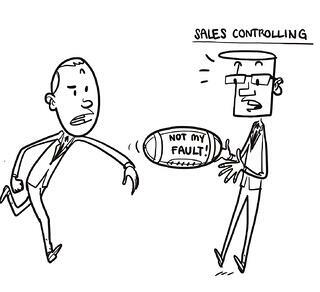 If sales people have a real problem with some aspect of the process or CRM, the CEO will soon get to hear about it. Sales Ops will be looking very closely at the pipeline for the next quarters and challenging the coverage factor and the status of large deals. They are accountable for delivering a reliable sales forecast so they will want to understand every deal and in particular, what is going on if a deal is slipping or looking as if it might fall through. Their job is to help you fix the problems and they have resources to do it. Kelly told me how she can ensure the right senior managers will get involved in a deal if she thinks it will help. And she can make sure they stay away if they will make things worse! Sales Ops have the access to resources and influence that will help you close difficult deals. Kelly also shared with me the increasing importance of compliance and revenue recognition rules. So it may be Sales Ops who are nagging you about your pipeline and scrutinising your deals, but they are just acting like a good teacher – pushing you to make the grade. Again, like a good teacher, Sales Ops will help you identify where you have room for personal improvement. And they have the resources and budget to deliver training that will fill gaps in your expertise. You should work with Sales Ops to build a personal development plan that can help you deliver better and better results every quarter. For those who have never watched a Bond film, there is a character, Q, who gives the famous secret agent the gadgets that give him the edge over the opposition when he is out in the field. Don’t expect Sales Ops to give you a jet pack or a car that converts to a submarine, but they can give you a huge variety of vital sales tools. Everything from presentation content and business cases to relevant case studies and contacts with colleagues and customers who could help you close a deal. Next time you are unhappy about Sales Ops nagging you about your pipeline stop and think about how you could use them to help you succeed. After all, they are just as keen for you to meet your targets as you are. Build a relationship with them and get them on your side and working for you. Sales Ops is looking for sales people who want to meet and beat their targets, who understand the need for process and look for ever better ways to sell. They will give the most support to the sales people who make the best use of their help and advice. Be that sales person. • Do you really understand what Sales Ops does? • Do you ask them for help? • Do you wonder why some of your colleagues get better access to resources than others?